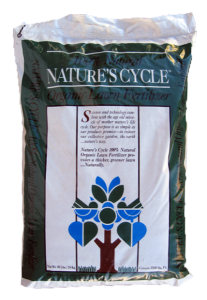 Nature’s Cycle Lawn Food supplies the university recommended 1 pound of nitrogen per 1,000 square feet. Nature’s Cycle Lawn Food is 100% organic. The ingredients are derived from DPW (Dehydrated Poultry Waste), blood meal, and feather meal. Nature’s Cycle Lawn Food is used by golf courses across the United States. Adds beneficial micro-organisms that helps bring dead soil back to life. Feeds the soil. Healthy soil is the foundation for a lush, green, healthy, lawn. Provides essential nutrients and trace elements. Increases root growth to thicken up your turf. Encourages vigorous root systems that help choke out weeds…naturally. For best results, apply Nature’s Cycle Lawn Food every 4-6 weeks according to the schedule indicated below. For correct application, set your spreader open 50%. Example: If the numbers on your spreader range from 1 to 16, you would set your spreader at ~8 (.50 X 60 = 8). After applying Richlawn Turf Food water normally. Safe for children, pets, wildlife and the environment.